Microcopy introduced a new sterilized polisher for nanocomposite, Gazelle®. Inspired by a gazelle’s agility and endurance, the exclusive Silatec process accomplishes both, producing a flexible polisher with durability. The shape retains its profile and polishes multiple teeth without breaking down. The Satin polisher is a workhorse for everyday restorations. Removing surface striations and defects, it polishes to a flawless satin sheen. The Hi-­Gloss is used for the most demanding esthetic restoration. It quickly polishes the surface to a wet luster gloss. These polishers also eliminate the need for messy polishing paste. Gazelle is an economical single‐patient-­use polisher designed for safety and convenience. Many polishers cannot be cleaned effectively because the silicone composition is damaged by heat from autoclaving. Gazelle solves this by sterilizing and individually packaging each polisher. 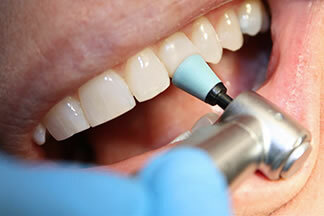 When finishing restorations, I am careful to ensure that they blend seamlessly with the existing dentition. The last step is polishing to remove roughness from the finishing. If a tooth is left with a rough surface, it makes it susceptible to plaque and stains. For the restoration to look like the natural tooth, I match the degree of shine to the adjacent tooth. So far, I have used both the Gazelle Satin and Gazelle Hi‐Gloss on class 2, 4 and 5 restorations. I have polished several different composites such as 3M FiltekTM Z250, Kerr Revolution Formula 2TM, and Parkell’s Epic® TMPT, on anterior and posterior teeth. After filling the prep with the composite and finishing it with a 12-blade carbide, I begin polishing with the Gazelle Satin cup. The Satin polisher removes the surface striations left by the carbide. The cup gives me the control to polish gingival margins and achieve labial characterization and anatomy. I used light pressure at 5,000 rpms. The polisher worked very quickly and kept its shape without crumbling. I was careful not to polish with long periods of pressure to avoid heat build up. As the composite becomes smooth, I lighten the pressure to give it a nice satin finish. This result is a smooth sheen to macth posterior teeth. For the anterior restorations I start with the Gazelle Satin cup and switch to the Gazelle Hi-­Gloss cup and use 5,000 rpms with feather light pressure. No polishing paste is needed with these polishers. Gazelle simplifies my polishing while achieving outstanding results on any composite.